The Bai are one of the most heavily Sinicized of China's 55 official minorities. 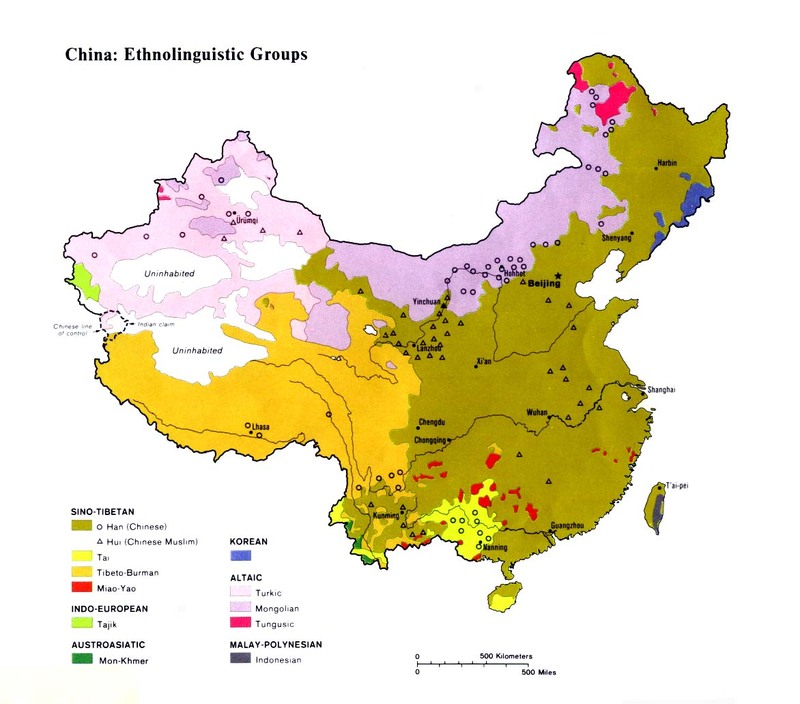 Although the Chinese acknowledge two separate branches of Bai — the Lemo and Nama — the Bai scarcely qualify as an ethnic minority. "During the 1940s… the Bai people denied their non-Chinese origin and would show offense if regarded as a minority." Various experts have commented, "The Bai like to be called Chinese." "The Bai nationality as an ethnic label was unknown to the Bai themselves until late 1958," and were "not quite a minority, but not quite Chinese either." The Bai partly established the powerful, far-reaching Nanzhao Kingdom which was centered south of Dali. The kingdom grew so strong that they were able to defeat the Tang armies in the mid-700s. The kingdom flourished for 400 years until it collapsed in the tenth century and was replaced by the Kingdom of Dali. Dali, in turn, lasted until AD 1252 when it was overrun and destroyed by the all-conquering Mongol armies. 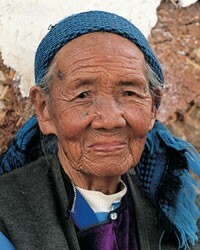 During the 30 centuries the Bai have inhabited Dali, they have gradually been assimilated to Chinese culture. Dali has always been famous for its prolific supply of marble, which gave the people their name (Bai means "white" in Chinese). Some of the marble used in the great Taj Mahal of India was obtained in Dali and transported over the Himalayas. A survey conducted in 1987 showed Dali Prefecture, mainly due to inbreeding, had 150,000 mentally and physically disabled inhabitants, including dwarfs. The Bai are followers of Mahayana Buddhism, unlike other Buddhist groups in Yunnan such as the Tai Lu, Tai Mao, Wa, De'ang, and Bulang who are Theravada Buddhists. George Clarke of the China Inland Mission was the first missionary to the Bai, arriving in 1881. Recent estimates of Bai Christians include figures of 20,000, 30,000, and 50,000. Most of the Bai believers live in rural areas in the mountains and in Fugong County to the west. Most Bai, however, have yet to receive an intelligible gospel witness. The words of John Kuhn 50 years ago remain true today, "No wide-spread work of evangelization will ever be done among them until the message is taken to them in the Minchia [Bai] tongue." View Bai, Southern in all countries. Location in Country: More than 1.5 million Bai were counted in the 1990 Chinese census. Yunnan was devastated by the plague, which began in Dali and lasted from 1812 to 1903. The population of Yunnan was reduced from eight million to three million, and the population of the Bai was severely cut. 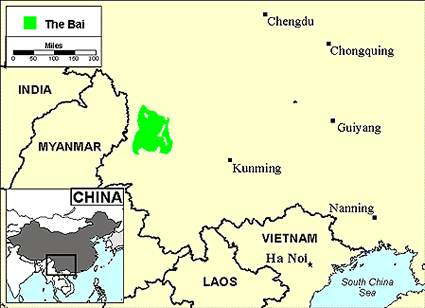 The Bai live primarily in the Dali Prefecture in central Yunnan. Dali has been continuously inhabited for 3,000 years. More than 120,000 Bai are located in Guizhou Province. Smaller numbers of Bai also live in Sichuan and Hunan provinces.